(PRLEAP.COM) "There are authors who live it and breathe it. And there are authors who can only dream about it. Harvey Kubernik's new book, 'The Doors Summer's Gone' relives his intense alliance to one of L.A.'s finest homegrown bands." – Gene Aguilera, East L.A. music historian and author of "Latino Boxing in Southern California." "While other literary endeavors focus on exploiting the folklore, Mr. Kubernik reveals the bare-bones of the Doors of perception. There is an old saying, 'When you have the choice of printing the truth or the legend, print the legend.' Wisely, Kubernik veers away from mythology and gives the back story from insiders' points of view …" - Jan Alan Henderson, author and contributor to "FilmFax Magazine," "Cult Movies," and "American Cinematographer." "Once again Harvey has taken key elements from the interviews he's done over the past 40+ years and woven them into a very descriptive perspective of The Doors, both musically and personally … The book is brilliantly put together and even the most casual Doors fan will enjoy the fly-on-the-wall memories who were there from the beginning and caught these guys performing in the clubs before and after their first record was ever released. The way the band grew in fan appeal (and mythical proportions) is unbelievable. Highly recommended." – Kent Kotal, "Forgotten Hits." View a pdf file of the "Forgotten Hits" thread continues on its Tuesday, April 24, 2018 "This And That". "Few music journalists have revealed the detailed facts behind rock's golden era as assiduously and lovingly as Harvey Kubernik. 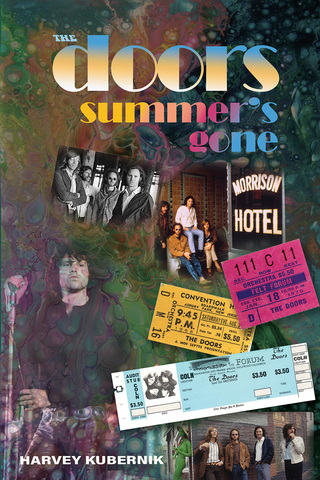 He once again delivers the goods with his Doors history, 'Summer's Gone.' " - Michael Simmons, "MOJO," "High Times." "Kubernik's masterful anthology gets behind, under, and beyond the tall tales and casts an uncompromised eye on their real art, their real story, their real impact, and their real magic." —Author Daniel Weizmann, "Drinking with Bukowski: Recollections of the Poet Laureate of Skid Row." "As he always does when putting sound and motion onto page, Harvey Kubernik strips away every candy carnival coating with the precision of background and experience, getting straight to the heart of the real matters. 'Summer's Gone' brings only the most insightful truths, from the most knowledgeable mouths, together under one cover." - Gary Pig Gold, singer-songwriter, record producer, filmmaker and author. 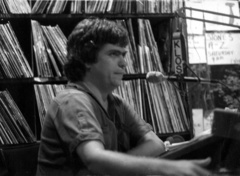 With 12 published books to his credit, some in coffee table format, Harvey has been a music journalist, pop culture historian and author for more than forty years. December 2017's book, "Inside Cave Hollywood Vol. 1" covered ten years of his bi-weekly contributions to the cavehollywood.com website. And now in spring 2018 "Record Collector News" magazine celebrates its 10th Anniversary, see the stunning page of 67 covers, 64 of which showcase feature stories by contributing editor Harvey Kubernik. 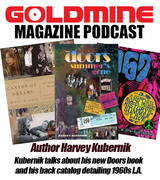 Monday, "Goldmine Magazine" editor Pat Prince posted his "Goldmine Magazine Podcast, Episode 25" on which he and Harvey discussed Harvey's slew of music books from 2009-2018. On Saturday, Harvey will be a guest interview subject on "ESPN's Dr. Robert Klapper's Weekend Warrior" broadcast at 7:15 a.m., discussing the Doors and Jim Morrison. If you miss it, later in the day a link to the broadcast will be available online, and "Kubernik's Korner" will post that link on Monday.